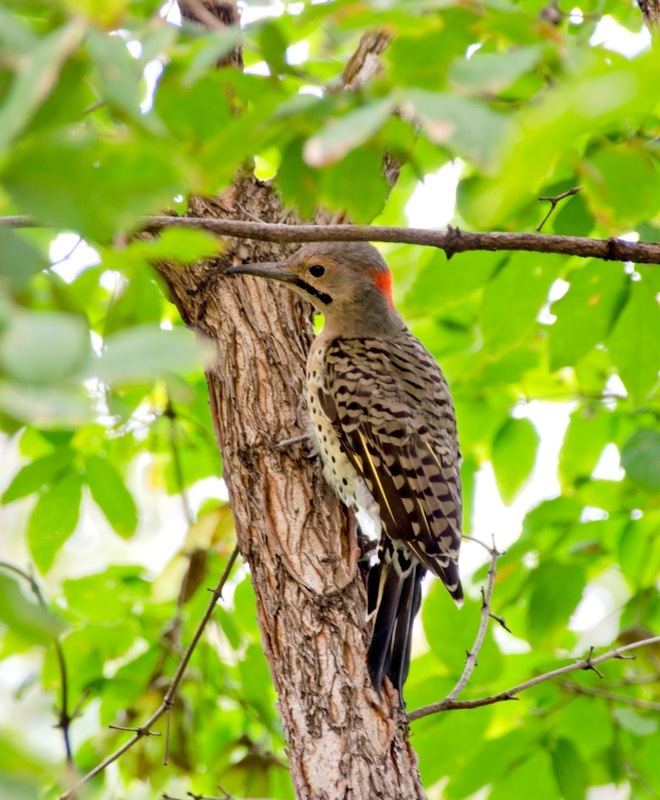 Last week I wrote about the northern flicker that landed in the tree by my window. 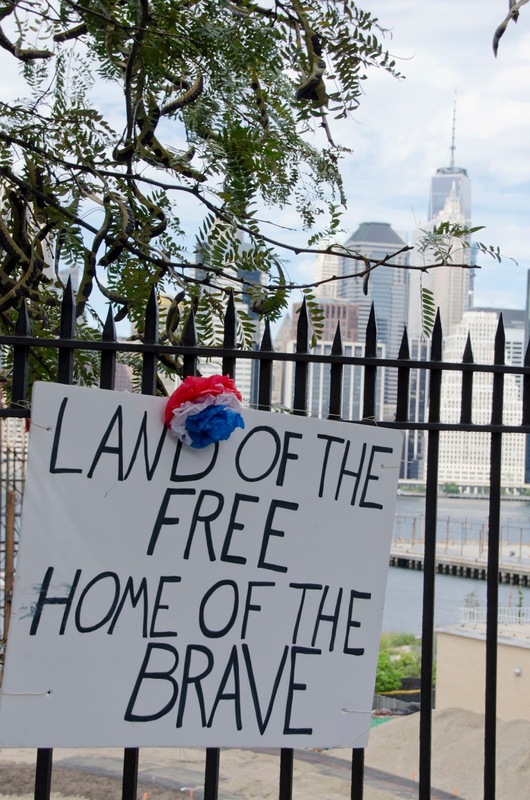 Here's a few more of them, this time on the grassy lawn that overlooks New York Harbor on Pier 1 of Brooklyn Bridge Park. There was a flock of flickers there this weekend. 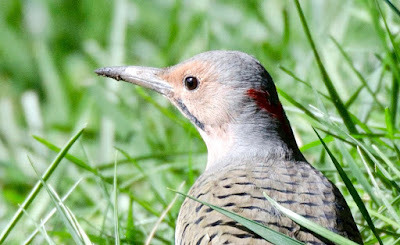 I was alerted to it by Heather Wolf who has taken pictures of ALL the birds in that park. Click on this link to see them: http://brooklynbridgebirds.tumblr.com. You can tell that the flicker pictured above is a female by her unmarked face. The male has a black mark on his face, usually called a mustache, but technically a malar stripe. Click to enlarge. The male also has a red crescent on its nape -- just like the female's. Both have dark tipped bills this day because they've been probing in the mud for tasty invertebrates. Look what landed in the boxelder tree outside my window! It's a woodpecker called a northern flicker, Colaptes auratus. 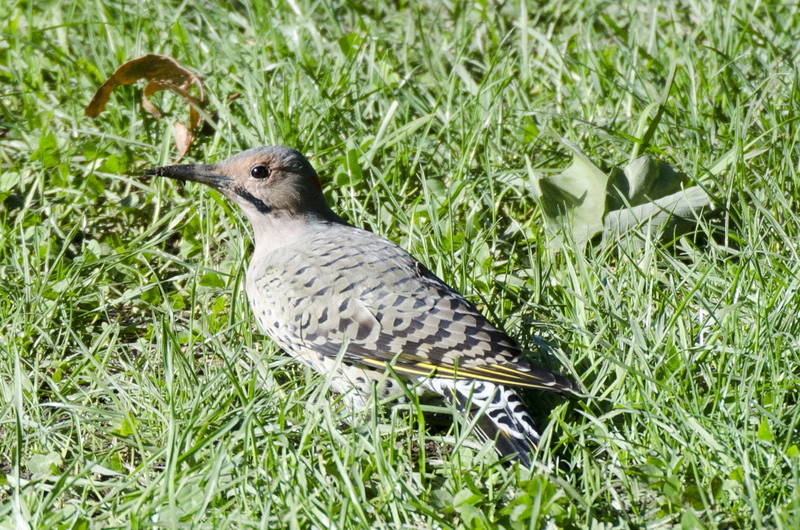 Although flickers are common in New York and across the country this is the first time I've seen one in my very urban Brooklyn garden. This birds was too big and noisy to miss -- about a foot long, and announcing its presence with repeated loud calls of kyeer as it eyeballed a little pile of raisins and peanut bits I had left on a fence post for the cardinals and robins. 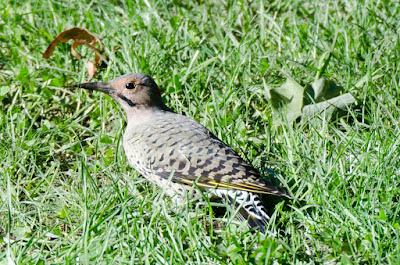 Although flickers eat mainly insects, they also take fruit and seeds, especially in winter. 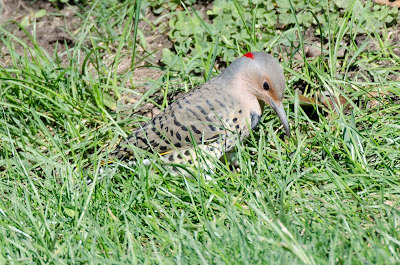 The northern flicker is mainly brown and tan. Click to enlarge the photo and you will see the pretty pattern of bars, crescents and spots in its plumage. Note the red crescent on its nape. This one's black mustache, or malar stripe, indicates that it is a male; females have plain tan faces. See those yellow lines on the closed wing? 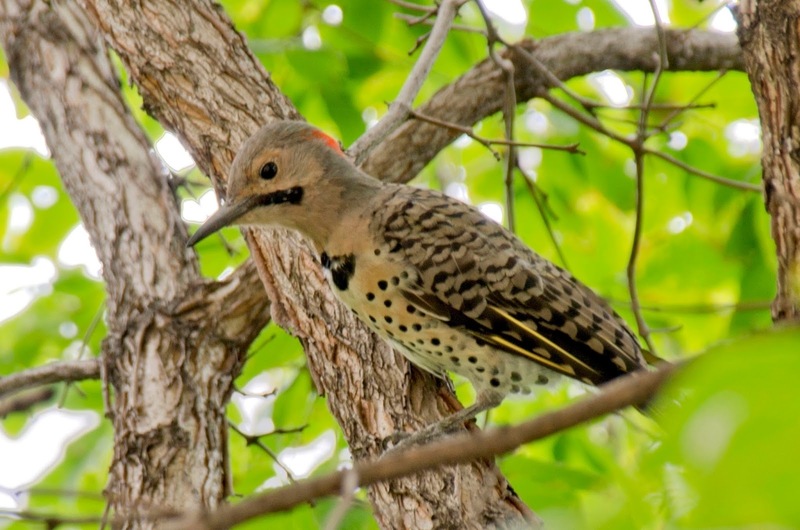 The undersides of the wings are the same bright yellow and make a pretty flash of color when the bird flies; the bird is sometimes called a yellow-shafted flicker because of it. Here he is in a typical woodpecker pose -- stiff tail feathers used like a prop for support. September 11 is a sad day in my neighborhood of Brooklyn Heights as we remember 9/11 2001. 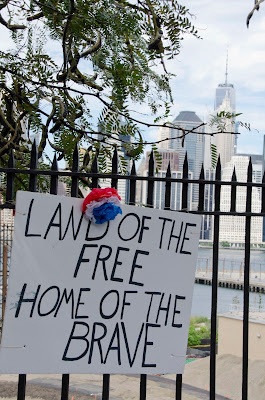 We are within sight and walking distance of the World Trade Center. 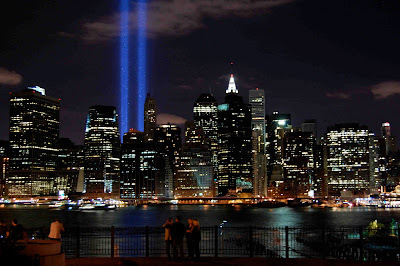 Last night's Tribute in Light reminded me of 2010, pictured here, when the lights attracted migrating birds. 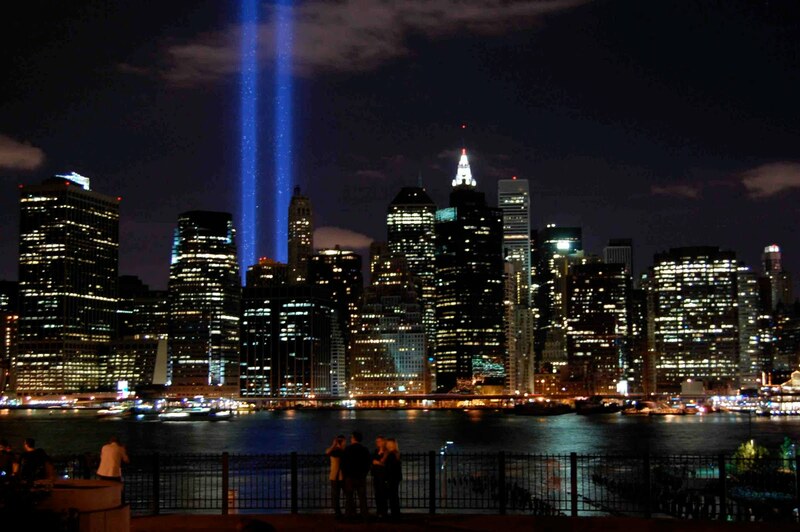 Click on the photo to enlarge it and you will be able to make out the sparkling specks in the columns of light. I wrote a blog about it then which you can read by clicking on this sentence. 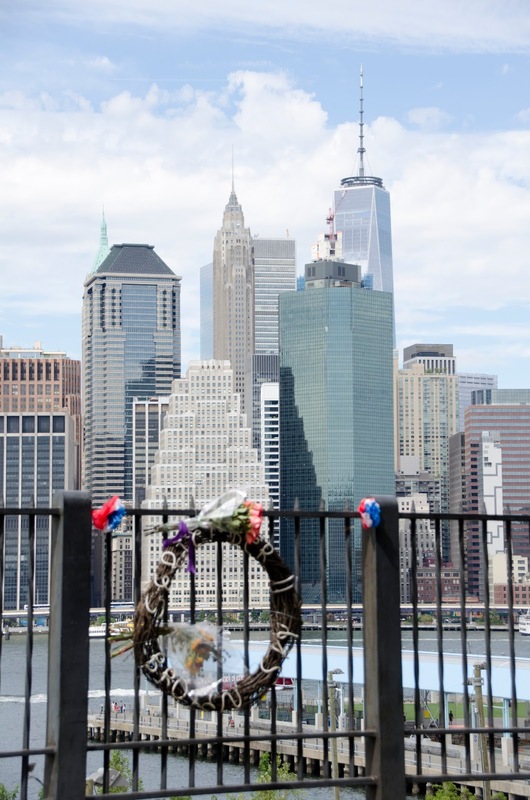 I watched much of the aftermath from this spot and I (and lots of New Yorkers) are still likely to burst into tears about it without much provocation. It hardly seems like it has been 15 years. 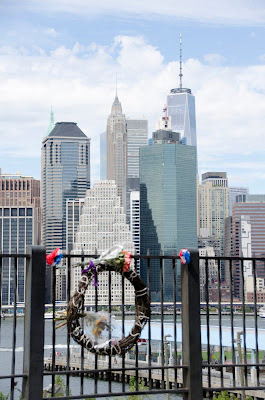 But there's the New World Trade Center in the skyline across the East River, seen from the Brooklyn Heights Promenade with one of the day's many spontaneous memorials in the foreground. And another. They are everywhere. 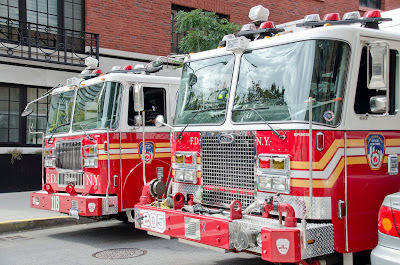 These trucks from our local firehouse, Hook and Ladder Company 118 and Engine Company 205, were parked on the street today to make space in the station for the annual ceremony. The FDNY's motto is New York's Bravest. Six firefighters from this station died responding to the attack. 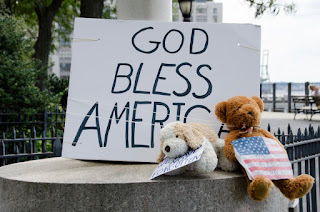 Click on this sentence to read more about them. 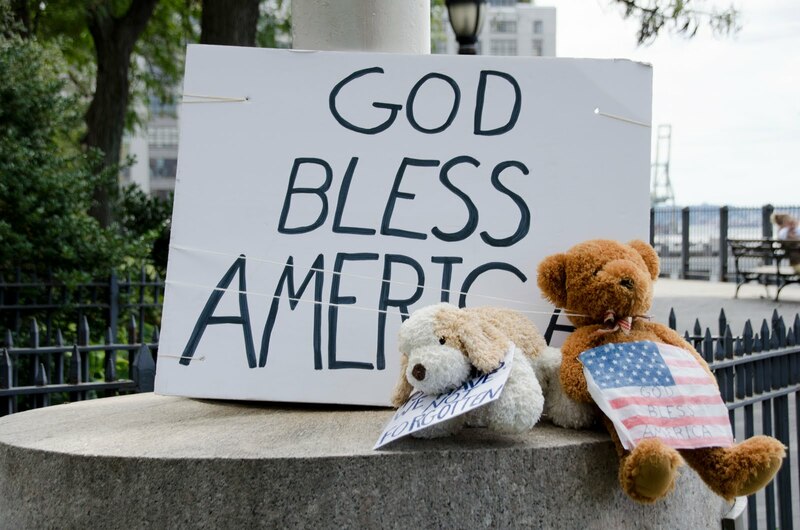 I took this picture at the Saint Patrick's Day parade this year. 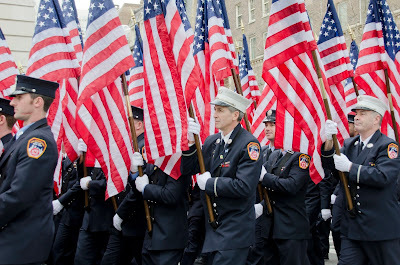 It is FDNY members carrying flags -- 343 flags -- one for every member of the New York City Fire Department who died at the World Trade Center on 9/11. 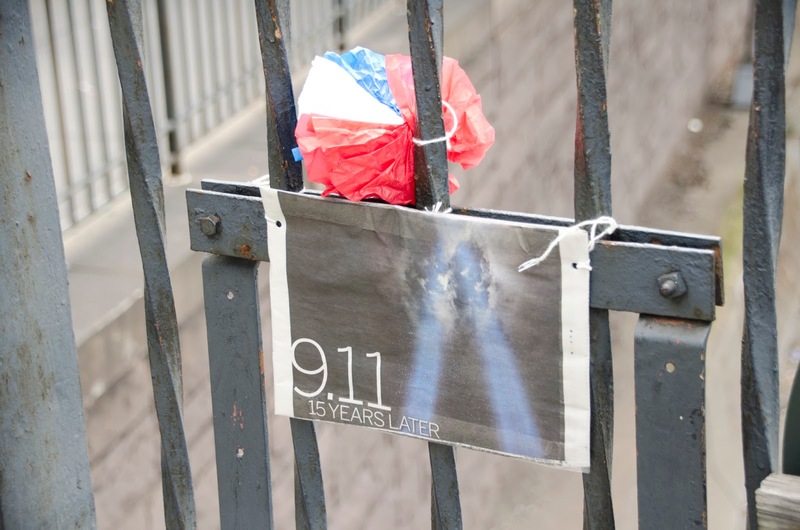 Such a sad day today in Brooklyn Heights and everywhere.